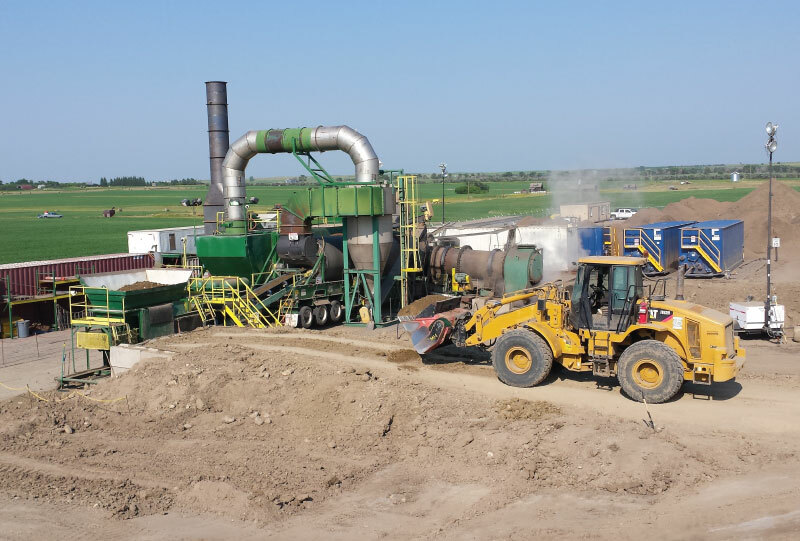 Using the process of Direct Fired Thermal Desorption or also commonly referred to as Low-Temperature Desorption, Nelson Environmental Remediation offers on-site extraction and destruction of toxic organic compounds to produce, as their slogan says – “Clean Dirt, No Doubt!”. Low-Temperature Desorption removes organic contaminants from soil, sludge or sediment by heating them in a machine called a “thermal desorber” to evaporate the contaminants. The evaporation process volatilizes the organic contaminants in the soil into a vapour phase (gases) which in turn, separates them from the solid material. The process is not a form of incineration and is defined by the Environmental Protection Agency (EPA) as “a physical separation process”. The volatilized vapours pass through a baghouse filtration system then into a thermal oxidizer and are oxidized into CO2 and water. The end goal of direct fired thermal desorption is to remediate soil so that it meets applicable remediation criteria, and is thus available for beneficial re-use. Success requires the combined experience of the NELSON team perfected on numerous large scale projects across the globe. But the end result doesn’t just happen – it involves the combined experience of the NELSON team, which has been created, honed and perfected on numerous large scale projects, across Alberta, Canada, the United States and internationally. NELSON has completed projects in Europe and Africa and continues to create international relationships for more potential remediation projects in the future. The process begins with excavating the contaminated soil or material for treatment in a Thermal Desorber Unit (TDU). With NELSON, the unit is assembled on site and the remediation and reclamation process is completed on site. To prepare the soil for treatment, large rocks or debris are removed or crushed, allowing the smaller particulates to heat more easily and evenly separate contaminants from the material. If the moisture of material is too high, additional mechanical handling may be required to improve the treatment process. The material is fed into the TDU on mechanical weigh belt and is then heated to between 350 and 450C to volatilize the organic contaminants effectively removing the contaminants from the material into the process gas stream, with a retention time of 12 to 15 minutes. The vaporized contaminants are sent through a baghouse to remove dust and then sent to the secondary oxidizer. The process gas stream output from the baghouse is routed through the ID fan into a modular thermal oxidizer/stack unit, which reduces the hydrocarbon content of the gas stream with a destruction removal efficiency (DRE) capable of up to 99.99% depending on contaminant concentrations. At this stage, the clean soil material exits the primary chamber of the TDU is re-hydrated to between 8 and 10 % moisture and then cooled. The remediation process is now complete and the soil can be backfilled into the original excavation site for beneficial re-use. There are numerous long-term benefits of NELSON’s process. The TDU process eliminates client liabilities associated with transportation of contaminated material to landfill or other off site locations and sourcing and transportation of clean backfill. Thermally desorbed soils result in a positive social outcome of beneficial re-use availability and reducing the possibility of contaminated material sitting in landfills. The result is recycled soil with enhanced community partnerships for our stakeholders. NELSON has worked hard to deliver a service where we can guarantee success, and retain the trust of our clients — past and present. We’ve delivered on our slogan of “Clean Dirt No Doubt!”, for more than 22 years offering soil remediation services using our mobile, on-site Thermal Desorption technology.